Throughout the history and surrounding mystery of the Beatles, there has developed a plethora of legend and lore surrounding the group. These legends coalesce from various sources such as, sprouting from gossip about the band, messages contained within their music, unique instruments the band used, 'Paul is Dead' rumors, to ultra rare pressings of their vinyl records. There is an encyclopedia of 'Beatle' myth to delve into and search out for those with the wherewithal, the ambition, and time. This weeks blog entry is regarding a mythical and almost fictional 'Beatle' product, and its unbelievable discovery. Just recently an Indiana antique hunter (Chad Pagel), and an area record store owner (Tony Gillespie) happened to exhume one of the rarest Beatles records. What makes this discovery unique is that the record just happens to be a special edition of the Beatles most universally famous LP, 'Sgt. Pepper's Lonely Hearts Club Band'. Finding this particular album is the equivalent to seeing a unicorn in the forest, and on August 10th this record will be making its public debut and hitting the auction block. Unlike the famed rare 'butcher cover' featuring 'stoned Beatles with meat' on its jacket, this record is the complete opposite, an alteration on a theme, and a change that makes the record a highly sought after piece. The idea behind the LP is different to say the least, and its sillyness is part of its charm. 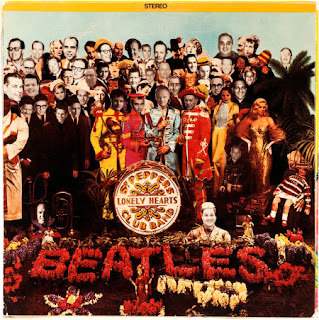 The instantly recognizable Peter Blake montage on the 'Pepper' cover had already become iconic only a few months after the albums release. By late in 1967 the folks at Capitol records decided to make their own special edition of the LP to celebrate a successful year, and some of the employees that worked for the label. A version of the 1967 stereo edition of 'Sgt. Pepper's Lonely Hearts Club Band' was designed specifically for Capitol Records sales executives in time for a meeting in Florida late that year. 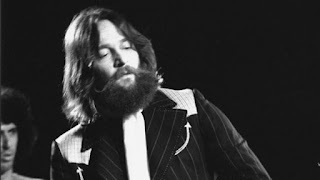 Replacing the faces of the Beatles, as well as a portion of the crowd were the cheerful mugs of many of the record label 'big wigs' and employees! Interesting indeed, and an idea that one can imagine John Lennon getting a real kick out of. Sources say there were forty to one hundred of these precious jewels made, with three to five known to exist in the hands of collectors, and zero ever hitting the open market. The value of the record is unknown being that there is no other sales to compare it to, but being a 'rock geek' myself, I know there is someone licking their chops and counting their change, waiting to pounce on this record. The value has been estimated in various publications to be up to and possibly surpassing 115,000 dollars! Even if the cover is a bunch of bureaucrats pasted over the "B's" on the most famous LP cover of all time, the scarceness and uniqueness of the record make it a skyrocketing specialty! The odd design of the sleeve, combined with its limited availability make this one of the most unique of Beatles collectables on vinyl to appear. 'Beatles' scholar Perry Cox ranks it as one of the top ten most collectible 'Beatles' items in the world! This record is the real deal and bound to gain interest as Beatlemaniacs 'gear up' for the day it revolves in the spotlight. The Beatles continue to soar in popularity, their music refuses to age, and their collectables become harder to find. This record looks primed to surpass even Fab Four autographs to become THE 'Beatles' collectable this year! Save your change rock fans! Now if I can just find my copy of a 'Butcher Cover' at one of these hot dusty flea markets, I'll be a happy little rock fan. It can be done! These guys in Indiana proved that vinyl treasure still lay in wait for the eager hunter, and dividends await with every new discovery. Thanks for the great write up Steve. Tony & I are really excited about this. Has been a fun ride especially meeting Perry Cox (who is da man). Have a great day ! Whoah!, That's pretty impressive, and it'll be interesting to see if more surface as the price increases.